For many years I spent my days endlessly examining the broadband marketplace, so when Comcast announced its deal to buy Time Warner Cable (TWC), I instinctively knew that the numbers would put Comcast very far above its nearest terrestrial rival once (and many say if) the merger is completed. Om Malik thinks the deal was entirely driven by Comcast's desire to scoop greater market share in the high-speed Internet arena and he's right to the extent that broadband is the future of pretty much all of communications - Internet, television, mobile. But as Comcast executives said during their analyst call to announce the deal, the merger comes down to money - a combined Comcast-TWC will yield lower costs, higher margins and greater efficiencies across the board, including in the purely high-speed arena. Still, looking at the numbers from the end of Q3 2013 (see chart), Comcast and Time Warner combined had nearly twice the high-speed Internet customers of the second largest terrestrial broadband company in the U.S., AT&T, 31.33 mil. compared to 16.43 mil. Even if Comcast sheds millions of those high-speed customers when it divests itself of some TWC systems serving approximately three million video customers, as the company says it would do to stay under regulatory concern caps, it would still be about 75% larger than AT&T. 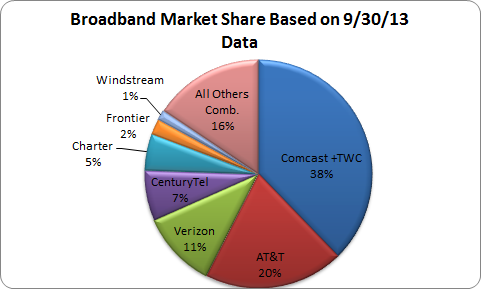 From a market share perspective, a combined Comcast-TWC would reach 38% of U.S. terrestrial high-speed customers, almost double that of AT&T and well over three times that of Verizon, the third largest provider of terrestrial high-speed service in the U.S. Despite this prospect, Comcast will still be pretty small in comparison to the world's two top wireline broadand providers. China Telecom currently serves 90 million wireless high-speed customers while China Unicom has 63 million broadband customers. 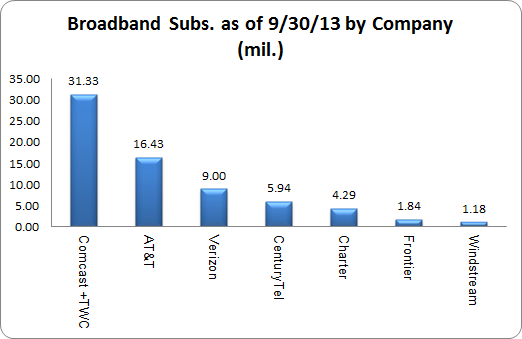 But it looks like Comcast could top NTT, which only has around 20 million wireline broadband customers.